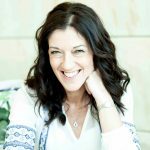 Sunday Times Number One bestselling author, Victoria Hislop, will be joining us to discuss her work and her affection for the Mediterranean. Her first novel was inspired by a visit to Spinalonga, the abandoned Greek leprosy colony. The Island then became an international bestseller with more than 5 million copies sold worldwide. Now, firmly established as one of our best-loved authors, she returns to Greece for her gripping new novel, Those Who Are Loved, set against the backdrop of German occupation, the subsequent civil war and a military dictatorship.